The Rule of One by Ashley Saunders and Leslie Saunders is the first book in the young adult science fiction dystopian series by the same name. The story is told by alternating the point of view between the two twin main characters and is set in the not so far off future of the US. Due to the shortage of food and supplies in the United States the government began enforcing the Rule of One, that no family shall have more than one child to curb the population. Everyone has followed that rule for decades with the exception of the head of the Texas Family Planning Division. One of the most powerful men in Texas and in charge of enforcing the Rule of One has held a secret in his own household, one that his wife died for. Eighteen years ago Ava and Mira were born in secret and have shared their life switching back and forth to avoid detection but the twins live in fear of discovery. 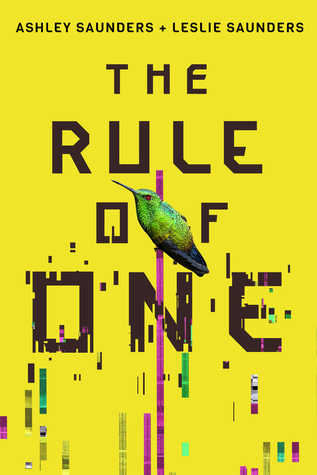 The Rule of One by Ashley Saunders and Leslie Saunders is a fast paced dystopian that takes off right away and doesn’t slow down. If anything I thought the majority of the story was well done in this dystopian tale but I did leave with a few questions that could have been answered with a bit deeper world building. However, that aside Ava and Mira’s predicament certainly grabbed my attention and made me want to know what would happen next. Hailing from the suburbs of Dallas, Texas, Ashley Saunders and Leslie Saunders are award-winning filmmakers and twin sisters who honed their love of storytelling at The University of Texas at Austin. While researching The Rule of One, they fell in love with America’s national parks, traveling the path of Ava and Mira. The sisters can currently be found with their Boston terriers in sunny Los Angeles, exploring hiking trails and drinking entirely too much yerba mate. Visit them at http://www.thesaunderssisters.com or follow them on Instagram @saunderssisters. I thought it was really fast paced too! The book kept me on the edge of my seat pretty much the entire time! YES! A book had recently sent me into a slump before this so I totally loved the pace!! Fabulous review! So glad you enjoyed! Wonderful review Carrie, so glad you enjoyed this first in a new series. I am going to see if I can find this one, you have got me interested. Thanks Carla! It’s a pretty quick read if you do pick it up, probably should still be available on NG.